With a wealth of experience designing and developing custom telephony applications with VOICE technologies since 1995, Voice Innovate Corp (VIC) is recognized worldwide as one of the most capable organizations that utilize voice biometrics, voice recognition and text to speech technologies to securely solve business problems. 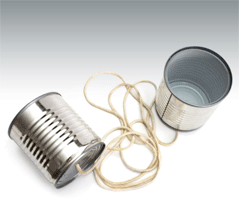 Two tin cans and a string – now that was innovative communication! Alexander Graham Bell with his first phone call in 1876 continued on this innovative path. Telephony was born and there was no turning back. Since 1995, Voice Innovate Corp as a voice pioneer witnessed and experienced firsthand the major challenges of the first wave of voice technology applications. Unfortunately for the voice industry, with disappointingly low deployment success rates, and a general lack of confidence in the technology, the reputation of VOICE was negatively impacted. Most companies went into a waiting stage for the technology to mature. We are witnessing an explosion of smart phone functionality. Voice Innovate Corp firmly believes that ONLY in the last 18 to 24 months has voice technology evolved to a point where it can be successfully integrated and deployed to solve current business process problems. Industry experts support this trend along with an acknowledgment that security is an ablsolute necessity. So NOW is the time to consider Voice as a premier technology that can indeed assist in solving your business process problems. Now is the time to invite Voice Innovate to show you exactly how. Voice Innovate has developed many different products and services to solve the unique business problems of a specifc customer or industry sector.